A lot of discussions are "out there" on the impact of climate change on fisheries. I should be posting more about this topic (and I will!). Is a difficult topic to grasp, yet the key message I find again and again is that "change is inevitable" and we need to figure out how to deal with it. Maps of projected Maximum Catch Potential (MCP) during different periods. (a) Mean MCP for the 1980–2000 reference period. (b) Change in MCP during 2040–2060 and 2080–2100 under Representative Concentration Pathways (RCPs) 2.6 and 8.5 in comparison to the reference period. This paper read quite worryingly, yet I have not enough knowledge to provide fair criticism, yet I suppose that the reviewers of Marine Policy have done that. I quote some aspects out of an entry of the Nereus Program webpage and the paper itself. Read it and I leave it up to you to make your own conclusions. Under the RCP 8.5 scenario, tropical Pacific temperature will rise by ≥ 3 °C by 2100. This is accompanied by declines in dissolved oxygen, pH, and net primary production. This will lead to local extinctions of up to 80% of marine species in some regions. 9 of 17 Pacific Island entities experience ≥ 50% declines in maximum catch potential. Impacts can be greatly reduced by mitigation measures under the RCP 2.6 scenario. The Pacific Islands region is the warmest of the global ocean. It’s also an area where there is less seasonal variability — it more or less feels like summer all year. Because there are no drastic seasons, the animals in the tropical Pacific may find changing conditions to be more of a shock. Changing environmental conditions are anticipated to alter the marine environment surrounding PICTs in a multitude of ways. Increases in SST and declines in surface oxygen, pH, and NPP are projected throughout this region with these impacts accelerating throughout the 21st century, especially under the RCP 8.5 scenario. Under RCP 2.6, these physical and biogeochemical changes are projected to be similar, albeit less severe. Together these changes in temperature, pH, oxygen, and NPP alter the ecological niches available to commercially important fishes and invertebrates. This results in high levels of local species extinction under both climate change scenarios as species either move towards more suitable habitats or as abundance potentially drops among species that are not capable of migrating. The species that become locally extinct are not replaced by as many new species moving into the area because relatively few species are adapted to the novel environmental conditions projected to occur in the western tropical Pacific by the end of the 21st century. 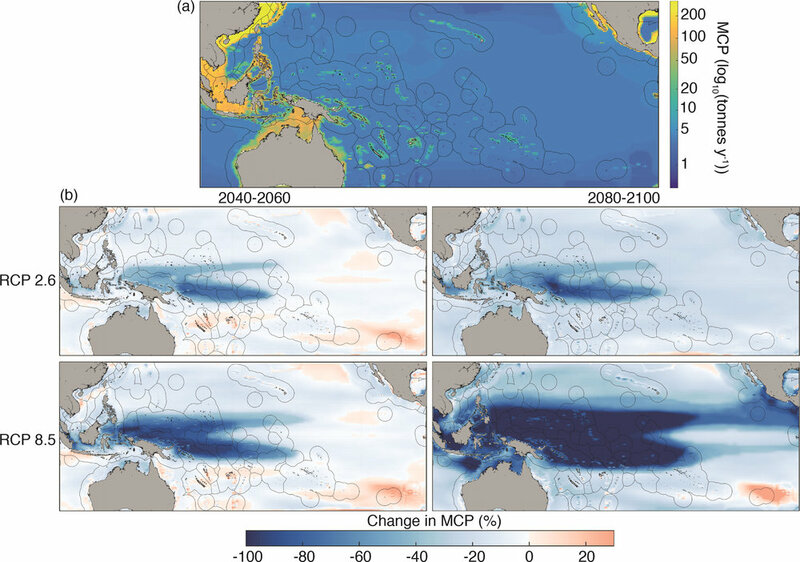 When taken together, these factors result in a decline in MCP that exceeds 50% across much of the tropical Pacific under the RCP 8.5 scenario. Climate mitigation measures can serve to drastically improve this projected outcome, with fewer areas experiencing large decreases in MCP under RCP 2.6.